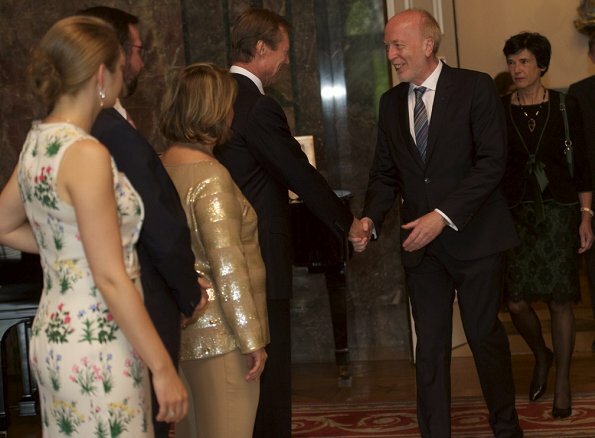 Grand Duke Henri and Grand Duchess Maria Teresa of Luxembourg held the second garden party of the season yesterday at the Berg Castle (Schlass Bierg) in Luxembourg. 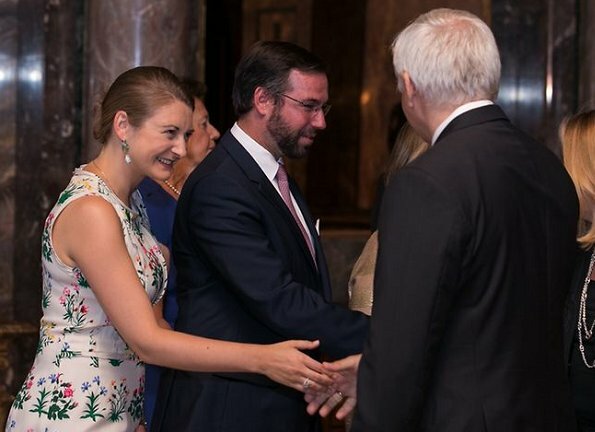 Hereditary Grand Duke Guillaume and Hereditary Grand Duchess Stéphanie also took part in the traditional reception at Berg Castle. 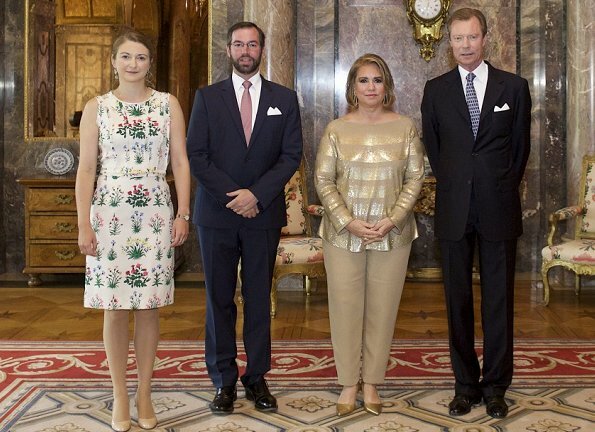 No, that was no good outfit on Maria Teresa. The top looks strange over the bust and the sleeves are too short and wrinkled. Is she not wearing a bra? Stephanie's dress is pretty and her shoes look comfortable! Garden Party, du lamé??? Il me semble que la Grande Duchesse Maria Teresa y est allée un peu fort! 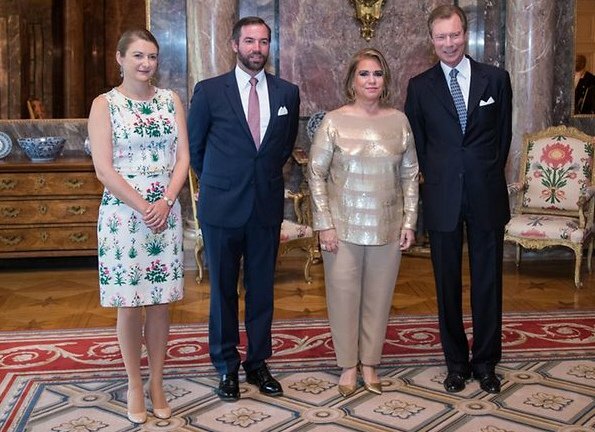 I think Grand Duchess Maria Teresa of Luxembourg wears more stunnig outfits, her looks make her shine, it's not just nice dress or nice trouser suit. But I had a thought that she can be more brave. For example, she can wear colour, maybe green shoes for this dress. 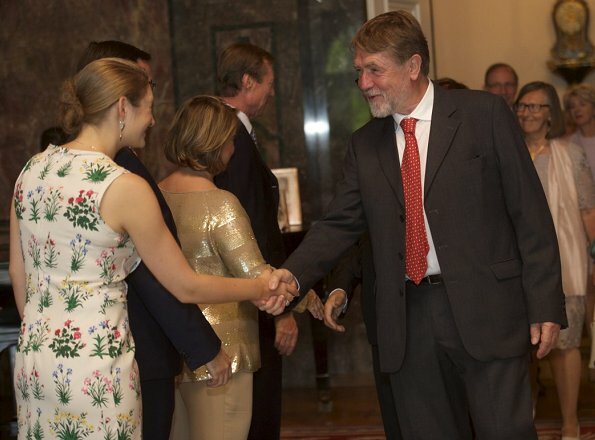 It's what i really like in Queen Maxima's style - she always has interesting colour-style desigions. Dear Stephanie, whoever you hired as a stylist should be given a bonus. Overa, you are looking better lately. Stephanie looks very pretty in her floral print shift dress. Very summery and appropriate to a garden party. Maria Teresa - just awful. The sludgy colour is not nice, the style of the top not flattering and neither are the trousers which have the effect of making her very broad around the beam. I like her very much but can't understand how she thought this was a good look. Boring dress, boring hairstyle, boring shoes. Stéphanies style was much better lately. And what is this with this strange posing in the first picture?? The print of the fabric would be better for the table cloth of a garden table than for a dress. The hairdo is downright ugly and makes her face look hard and masculine. Her terrible posture ruins even her better outfits. Actually Stephanie has scoliosis and one arm is longer than the other. It is why she tries to hold something like a purse of scarf, If she doesn't then she is criticized for her posture, which she can not control. She looks just fine and there is nothing masculine there at all. 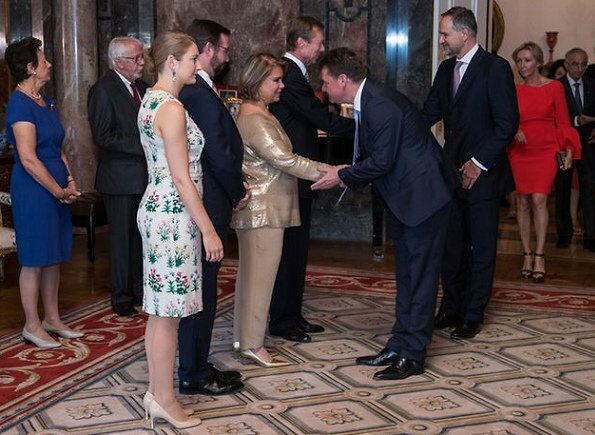 Maria Teresa's shimmery top would look better with classic, black trousers on her - maybe a soft silk for the summer? The first impression that Maria Theresa is having snake skin as blouse takes my thoughts completely away of any good fashion. 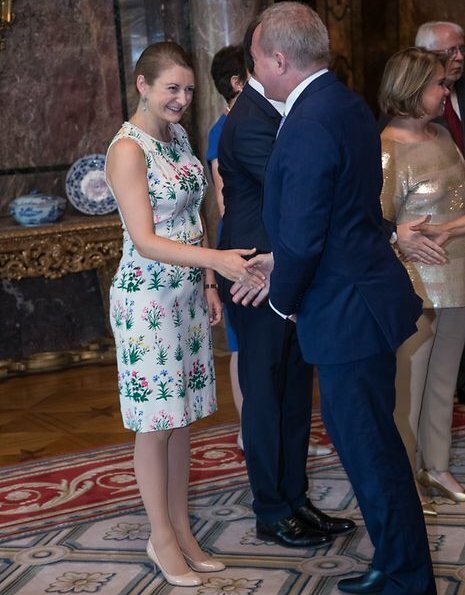 Although Stephanie´s dress is nice length, it is rather uninspiring. Stephanie fraiche et jolie pour la circonstance. Juste ce qu'il faut! Stephanie looks nice and summery and very appropriate - but it is a little bit disappointing with the bland shoes and rather severe hairdo. However it is still much better than she was doing before her recent transformation. 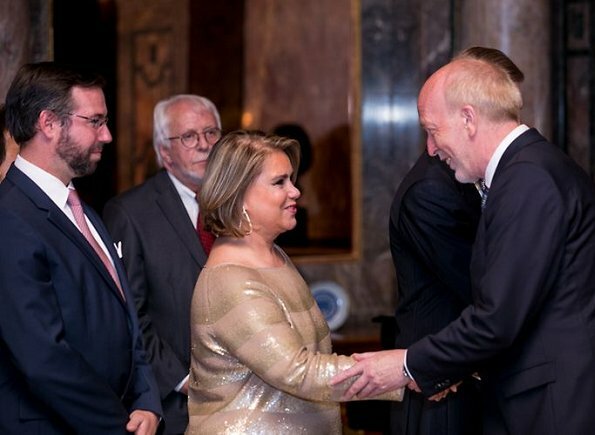 Maria Teresa does not look good. The outfit is ill-fitting and unflattering, the fabric is unsuitable and she is wearing far too much makeup. Hmmm. Garden party with lame? Did she get confused as to where she was going? Wrong pant shape too, this tappered-in style does nothing for her figure. And the colour is terrible. Massively disappointing. On all accounts. I am trying to find a positive thing to say about her, but if just doesn't exist. Stephanie on the other side looks great. Lovely dress, print is quite appropriate for a garden party and she looks radiant. Lovely. 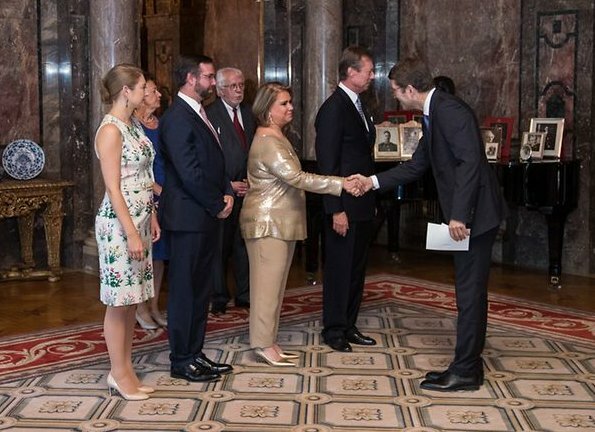 Maria Teresa's outfit makes her look big and boxy, doesn't do anything for her, the color, the fit. Stephanie looks lovely! Who'd have thought that Stepahnie now dresses better than her MIL?